Convictions based in Animism hold a prominent place in Thai culture as spirits are a pervasive and enduring element of local belief. It is no stretching of facts to state that a majority of Thai people believe in ghosts and hold a place of not just acknowledgement, but reverence for spirits in many aspects of their daily lives. This is a culture that has an intrinsic respect for the dead and treats them accordingly, for Thais learn from a young age that ghosts are real and that deference must be shown to the spirits. Many people in Thailand live in a perpetual and cautious observance and fear of ghosts, as they are seen to inhabit not only buildings, but the very trees that rise from the earth and even the waters that flow over rocks in the rivers and seas of the nation. Thai people believe in dozens of different forms of ghosts. There are ghosts with the skeletal heads of horses, ghosts that fly about at night riding a mortar, tiny ghosts that eat livers, and ghosts of all different kinds of trees. Some Thais might even turn to a spirit to solve problems involving anything from love to money to health. Some even believe that by treating well the spirit of one who perished in a car accident, you'll be given a good parking space or a clear course through Bangkok's horrendous traffic jams. To say that spirits are taken seriously in the Land of Smiles is an understatement. Every place of domestic or commercial life hosts a ‘sarn-pa-bhum’, or 'spirit house', located prominently in front of the building. It sits as a separate but essential residence for the spirits who inhabit the buildings alongside the living. These ghosts, in the mind of Thais, exist just as tangibly as the living. Daily offerings of joss sticks, candles, rice, and carbonated beverages (especially Strawberry Fanta) can be found placed carefully in spirit houses. The living residents of the premises hope to appease the ghosts so as not to offend them and be subject to their subsequent nefarious wrath. 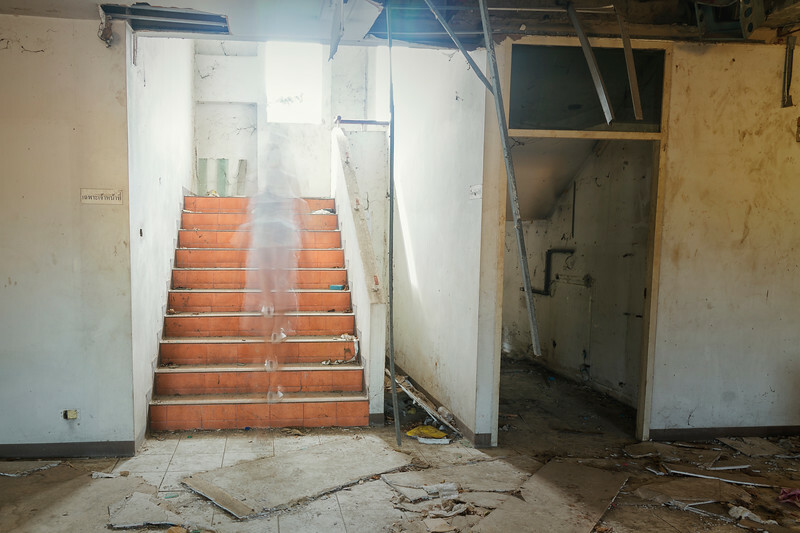 It is, therefore, no surprise that abandoned locations in Thailand are often understood to host spirits. This is especially true if some horrific event has occurred on the site, however it is not necessarily required for a haunting. Often, if a place has been void of the living long enough, it is just assumed that ghosts have moved in. Ghosts in Thailand and hold a place of reverence in the minds of the people. The intent of this series is to create a visual representation of these spirits, the presence of which are often felt and not seen.